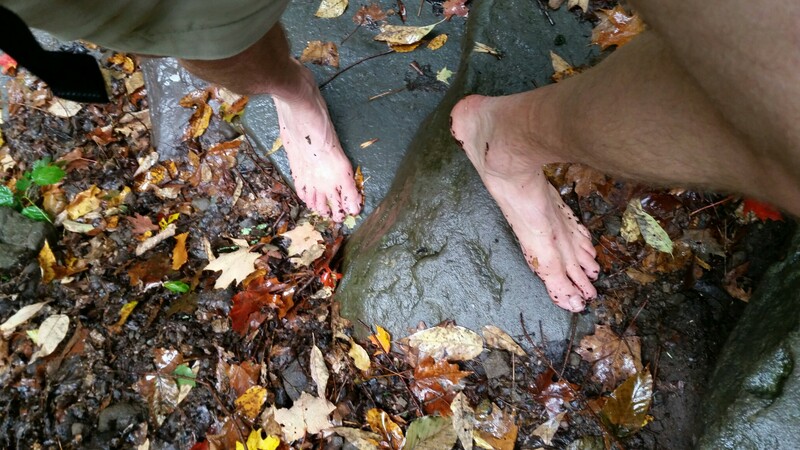 With inclement weather in the forecast, another barefoot hike in the mountains might’ve seemed a questionable proposition. But I had become determined to conquer all 35 of the Catskills’ highest peaks — and with six down so far, I had set my sights this weekend on completing four more — and then growing ambitious and impatient, imagined climbing six or even eight. But upon reaching the trailhead on a very grey afternoon, the car’s thermometer read 45 F, and it was raining. For a system still acclimatized to summer, this would be a shock. When you throw yourself into the wilderness, you want to challenge, not overwhelm yourself. To make up for shorts and bare feet, I piled four layers on top: goretex shell, micro-fleece jacket, quilted sweater, and long-sleeve t-shirt. Plus hat and gloves. And now somewhat better shielded against the cold, I marched out onto the trail, accompanied by Odie the Labradoodle, who is always up for a hike, never wears shoes, and is rarely fazed by weather. 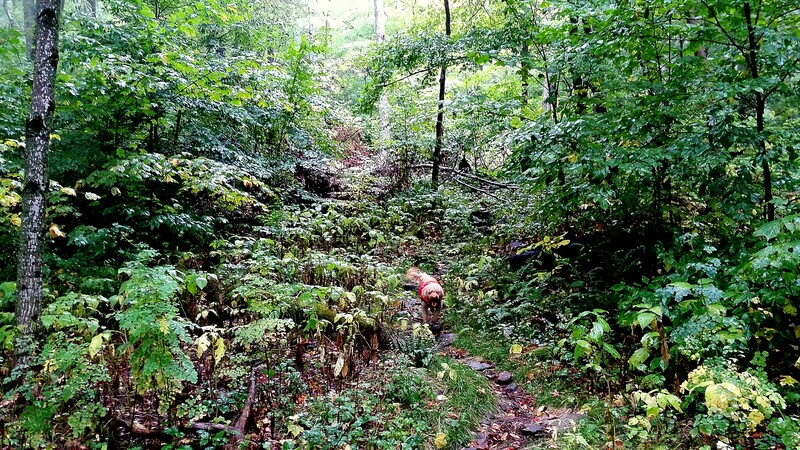 At first, the trail was relatively flat as it paralleled a dry streambed. 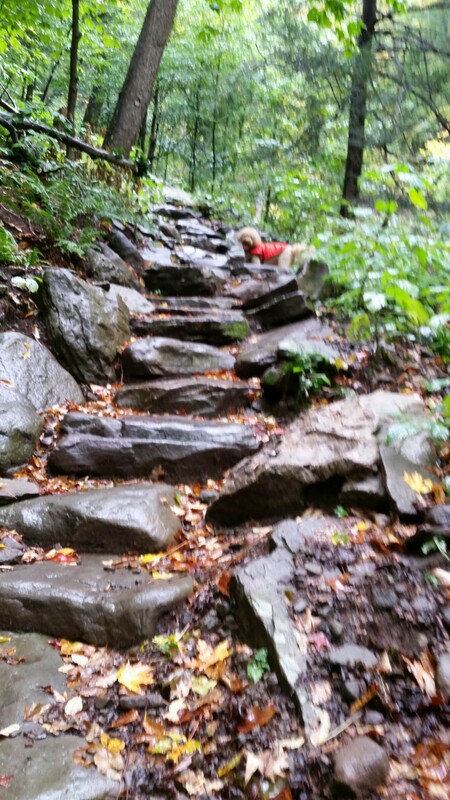 Like all Catskills trails, this one was eroded and rocky, but I felt a little faster than on past barefoot hikes. Maybe there was less gravel, or maybe a fresh carpet of wet leaves made for a softer tread. Or maybe I’m starting to get the hang of this barefoot thing, I thought to myself. Without the protection of shoes, I’ve discovered the whole body acts like a spring, cushioning the impact of foot on rocky terrain. The leg swings forward quickly, but then there’s a pause, as your eyes search for the best place to step. You land on the toes and ball of the foot, core muscles engaged, quads and calves taking up the shock. Just as I was starting to feel confident, the path turned straight up, like a rocket thundering into the sky; it was headed for a ridge-top saddle that lay one mile away and 1,000 feet higher up, for an average grade of almost 20%. One section is so steep, they built a staircase of boulders. Odie romped ahead, while I stepped from boulder to boulder. Then the path switched back and forth across a steep slope. My feet began to feel chilled from the cold ground. I focused on my breathing, as karate and yoga instructors would have one do, and tried to direct it toward my feet to warm them. This had little effect. At the same, thanks to the steep climb and four layers of insulation, the rest of me was getting warm. Too cold — too hot — multiple warning bells were going off. I paused, unzipped a couple of layers, and caught my breath. Then I resumed the climb, trying unsuccessfully to warm my feet through force of will. As we neared the saddle, the light got a little brighter. The rain continued steadily, while gusts of wind stirred the trees. Reaching a four-way intersection, I pointed the way to Balsam Mountain, and Odie took off ahead. The summit lay 0.8 miles away and another 500 feet above us. We were winding up and around rocky outcroppings, and despite cold feet, I began to notice little things. Different forms of moss and lichen nestled among the rocks. 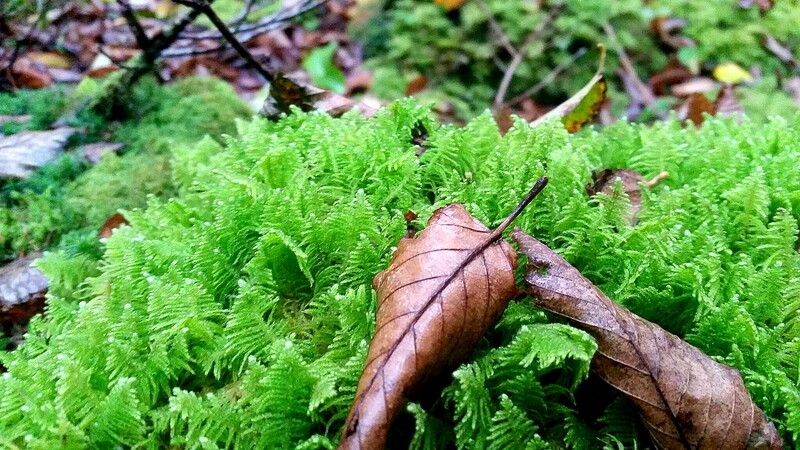 Ferns and club moss lined the side of the path. 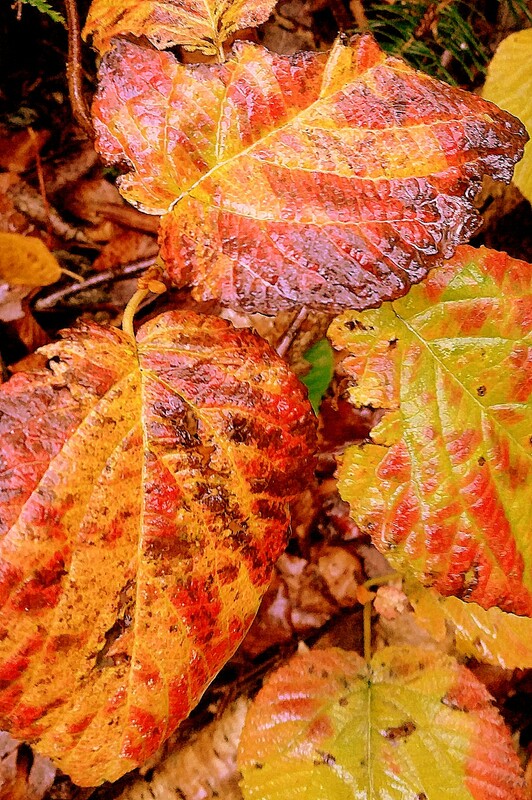 Maple and beech leaves littered the ground. 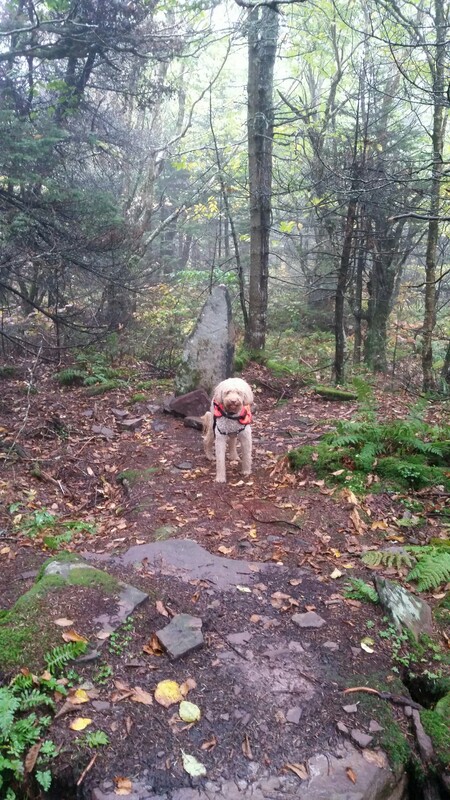 We reached higher ground; Odie nosed around a side trail and discovered a cairn of rocks in a small clearing. This was Balsam’s summit, roughly 2.7 miles and 1,500 feet in elevation from the start. Despite the four layers, I was feeling cold, and the bottoms of my feet were now numb. We peered around in the mist for a moment, and then headed back down to the saddle. From the saddle, our next objective lay 2.1 miles to the South along the ridgeline. The trail wasn’t too steep, and there were some smooth sections where I was able to pick up the pace. Then the path took us through piles of rocks tumbled haphazardly, some of smooth sandstone, others of rough conglomerate, all requiring thoughtful placement of each and every step. 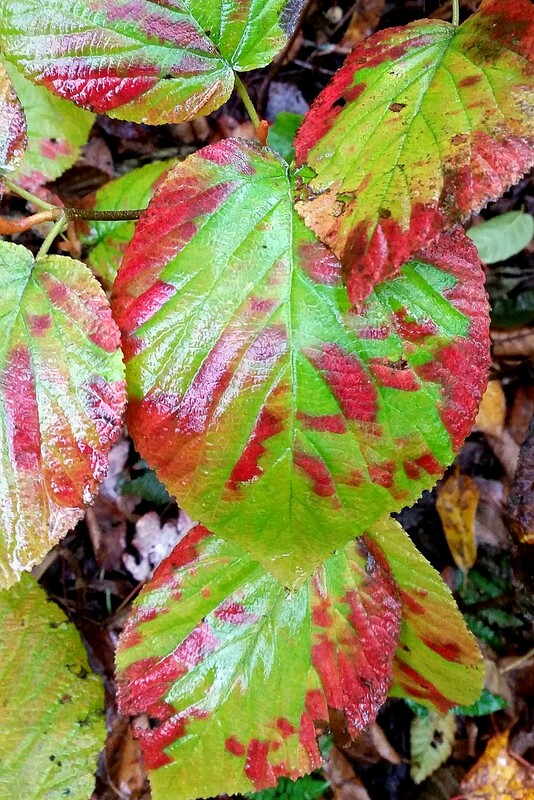 Around us, the hobblebush was dying back from the cold, leaves turning color flamboyantly, before withering, blackening, and curling along the edges. In the spring I had admired the clusters of white flowers on this prolific bush, and a few weeks back I had noticed its berries scattered across the trail. 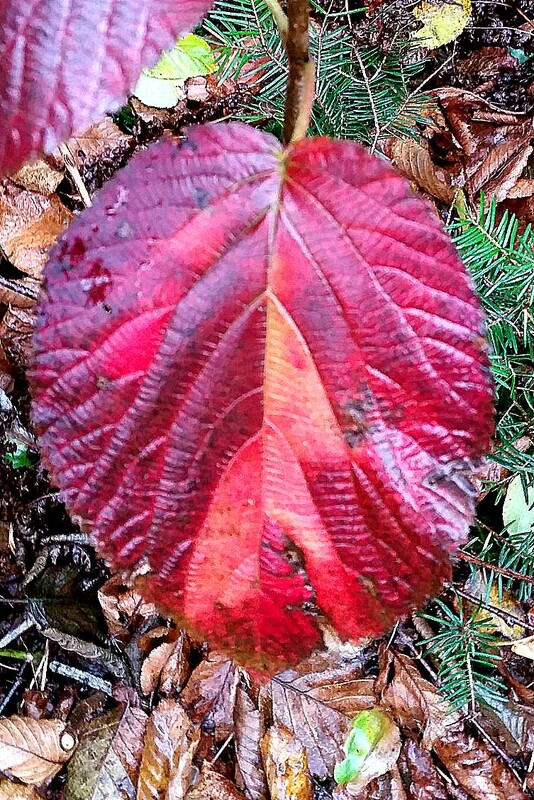 With big, floppy, heart-shaped leaves, this clown-like plant makes you smile, until you get caught in a thicket while trying to move cross-country and trip on (get “hobbled” by) its stems. My feet had finally warmed up! I charged ahead, then realized that Odie had stopped behind me. He had noticed the side-trail which leads to a clearing and a cairn of rocks. We had arrived at the summit of Eagle Mountain. My plans had called for us to climb a third mountain, and perhaps another after that. But while my feet had warmed up, the rest of me was feeling the cold — and this despite four layers. The wind picked up. It was getting dark. We decided to call it a day. 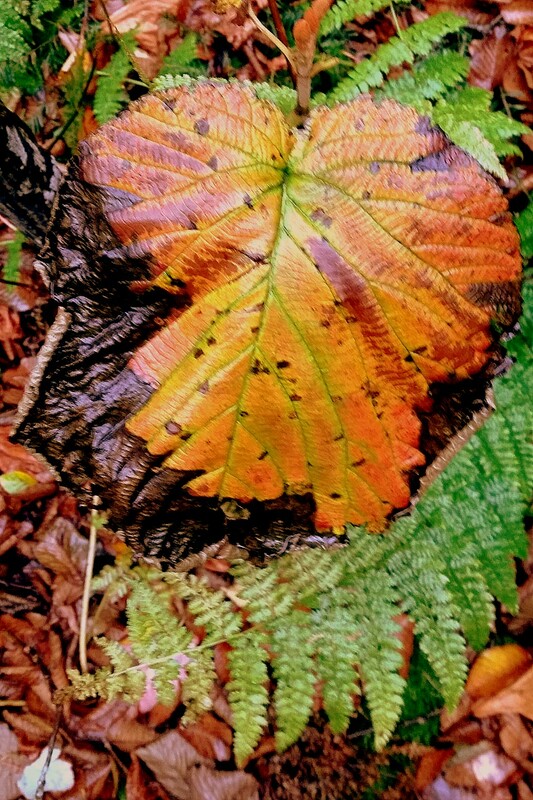 On the way back, fallen maple leaves glowed orange and red in the twilight, and then a distinctive patch of moss caught my eye. Composed of triangular-shaped leaves, it looked like a miniature forest of fir trees. Once home, I looked it up and identified it as Knight’s Plume Moss (Ptilium crista-castrensis). Soon it was pitch black. I pointed my flashlight on the steep descent and we stumbled down slowly. I had put on LUNA sandals to make faster time on the descent, but the muddy sections were slippery. Odie followed close on my heels, sometimes stepping by accident on the back of the sandals. By the time we returned, it was eight o’clock in the evening. We had been out for six hours on a round-trip of almost ten miles. 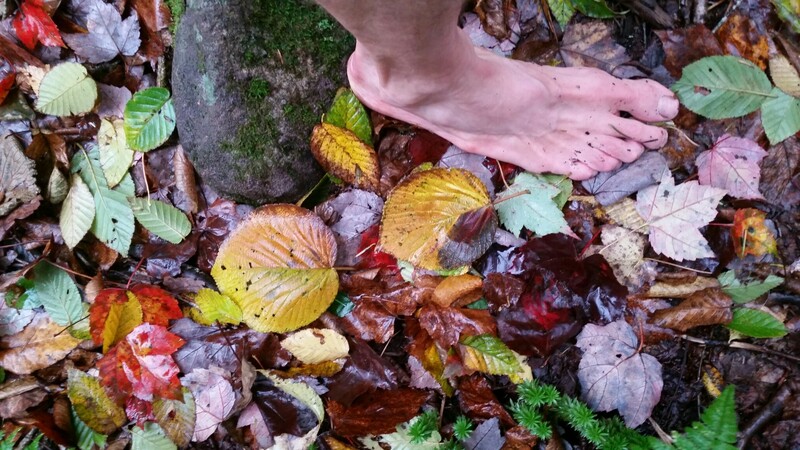 Balsam and Eagle brought me to eight out of thirty-five in my quest to conquer the Catskills without shoes. On the next trip, we’ll be better accustomed to the cold and perhaps I’ll move a tiny bit faster over the rocky terrain. Odie and I hope to complete a few more before winter. Cold rain is one thing, but snow and ice are not to be trifled with.